Open House matches students with piano teachers. An annual quandary… how do I occupy the kids this summer? Is it possible to mix fun and education? Parents and grandparents may discover one great solution at the Hall Piano Company’s Open House on Saturday, May 31st. 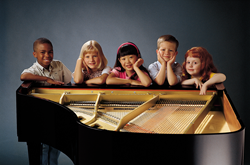 From 10:30 a.m. to 3:00 p.m., the community is invited to bring their kids out for a Complimentary Piano Lesson and the opportunity to meet the teachers available through the Hall Piano Company Music Academy. The Academy, sponsored in partnership with the Steinway Society of New Orleans, provides an opportunity for kids of all ages to explore music through the piano. From pop, jazz, and classical to gospel, praise/worship and improvisation, our musical educators help their students discover abilities, set goals and enjoy the musical learning experience. In addition to piano lessons, Hall Piano’s services include piano rentals and sales, acoustic and digital piano sales, and method books. Adult lessons are also available. The Open House will be held at Hall Piano Company, 701 David Drive, Metairie, Louisiana from 10:30 a.m. – 3:00 p.m. There will be refreshments, package giveaways, special summer rates and a discount on future lessons. Hall Piano Company is Louisiana’s premier Steinway & Sons dealer. For additional information about the Open House or available services, contact Emily McWilliams at 504.733.TUNE.